Mas Vacquières, a secluded jewel, located in a cluster of centuries-old stone farmhouses, romantically nestled in a wooded hamlet in one of the most beautiful areas in France; the county of Gard in the Languedoc-Roussillon nearby the Provence with its Lavendel, Avignon Palace of the Popes, Nimes with the Roman influences and the world famous Pont du Gard, Uzès and the colorful market on Saturday, the Cevennes and the Gorges du Tarn, Camargues known for its white horses, flamingos and wonderful white beaches.This is all in an one hour distance. A rare find for the traveler seeking decorator-perfect decor, stunning architectural design, award-winning gardens, a swimming pool hidden by ancient walls of a former fold - size 6,5 x 12,5 meters (20 x 38 ft). We welcome our guests as if they are family and make superb dinners served on our flower-laded terraces with products of the region . Our great passions are gardening and cooking. Several times a week we prepare a superb dinner for our guests, which is served on our private terrace with its gorgeous views. There is a spacious living room which is as comfortable as it is beautiful, along with flower-laden terraces. 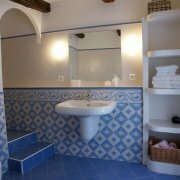 Our Chambres d'Hôtes has four double bedrooms and one family room Viola which is suitable for four people. Each room is provided with a bathroom (shower, toilet, handstandwash) and has at one's disposal a terrace and a luxurious, comfortable living room which will be cool in summertime and during the winter we light a fire. All our rooms are centrally heated and has a wireless internet facility. En suite in our Provençal kitchen you will find coffee and teasupplies, or what would you think of a glass of wine for the late sunny afternoon in the garden. The nearby historic City of Uzès ( the first Duchy of France) has many monuments, such as the Ducal Castle and the Frenestelle Tower. Apart from the typically medieval magic you may enjoy the wonderful little shops, the picturesque market twice a week on wednesday and saturday with a Provencal scent and a lot of handcraft products and the numerous cosy outdoor cafés. Mas Vacquières is quite close to Uzès ! Pont du Gard, the 2000-year-old example of Roman architecture. Part of a 50 kms long, partly underground waterway, it transported water from the source of Uzès to the City of Nîmes. The City of Nîmes, also the “French Rome”, has many well-preserved sights, such as Maison Carrée, the imposing Roman Arena, the Tour Magne and Jardin de la Fontaine. Furthermore its summer festivals, named “Ferias”. The City of Avignon, the walled town on the Rhône river, still shows its importance as medieval religious European centre; the Palais des Papes (Popes’ Palace) with its ten towers an impregnable fortress. Between mid-July and mid-August the Palais des Papes is the centre of the well-known Avignon Festival. The City of Arles, has a long history and considerable important in the Roman province of Gallia Narbonensis. And well-known for the Dutch post-Impressionist painter Vincent van Gogh; 1888-1889. The Camargue, known for its white horses, flamingos and wonderful white beaches. Visit St. Mairie de la Mer, a very special seaside resort and place of pilgrimage. Besides discovering these places of interest there are plentiful opportunities for walking. It is our pleasure to adviseyou !! Lots of Medieval places worth seeing, golfing, horseback-riding, canoeing and even going on a balloon-flight is among the possibilities.